A cookie is a harmless text file that is stored in your browser when you visit almost any webpage. These tools play a key role in the provision of many information society services. Among others, they make it possible for a webpage to store and recover information about the navigation habits of a user or his/her device, and, depending on the information obtained, they can be used to recognise the user and improve the service provided. A cookie is not a virus, a trojan, a worm, spam or spyware, and it doesn’t open pop-up windows. Depending on the entity managing the domain from which the cookies are sent and processing the data, two types of cookie can be distinguished: own cookies and third-party cookies. Own cookies: sent to the user’s device from equipment or a domain managed by the publisher of the website from which the service requested by the user is provided. Third-party cookies: sent to the user’s device from equipment or a domain that is not managed by the website published, but rather by another entity that processes the data obtained through the cookies. There is also another classification based on the period of time during which cookies remain stored in the client’s browser: session cookies or persistent cookies. Finally, there is another classification involving five types of cookie according to the purpose of the processing of the data obtained: technical cookies, personalisation cookies, analysis cookies, advertising cookies, and behavioural advertising cookies. Technical cookies: they make it possible, among other things, to find when a human being or an automated application is browsing, when an anonymous user and a registered user are browsing. These are basic tasks for the operation of any dynamic website. Analysis cookies: they collect information about the type of navigation being used, the sections most frequently used, products viewed, hours of use, language, etc. Advertising cookies: they display advertising on the basis of browsing, country of origin, language, etc. Through web analytics strictly statistical information is obtained pertaining to the number of users accessing the website, the number of pages viewed, visit frequency and repeated visitors, visit length, the browser used, the operator providing the service, the language, the terminal used, or the city where the IP address is located. This information enables Okodia – Translation Group to provide a better and more suitable service. Under no circumstance is information obtained about the user’s personal data, ensuring the preservation of online users’ privacy. Another cookie downloaded is a technical cookie called ASP.NET_SessionId. This cookie makes it possible to store a unique identified per session through which data required to enable browsing can be linked. Okodia – Translation Group displays information about its Cooke Policy on any website page at the start of every session so that you will be aware of it. Accept cookies. This warning will not longer be viewed when accessing any website page during the current session. You will be unable to share contents from our website on Facebook, Twitter or any other social media. 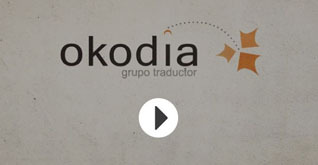 Okodia – Translation Group will be unable to adapt its contents to your personal preferences. You will be unable to access the personal area in the iuratum webpages, such as My account, My profile and My orders. iuratum online shop: you will be unable to make online purchases. You will have to buy via telephone or email. You will be unable to personalise your geographic preferences such as your time zone, currency or language. Okodia – Translation Group will be unable to perform website analysis regarding visitors and website traffic, which will make it hard for its website to be competitive. You will be unable to leave comments on our blog or rate contents. Okodia – Translation Group will be unable to know if you are a human being or an automated spam application.